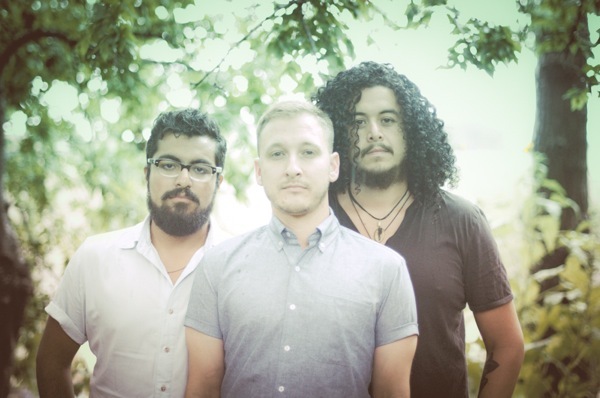 Listen to the explosive post-rock of Migrant Kids' new single, "Lucktear"
Cousins Miguel Ojeda and John Zakoor are the children of migrant families, so when they joined together as a band in 2011, coming up with the name Migrant Kids didn’t really require much effort. The cold winters of their Detroit home, however, could freeze more than just your thought process, so the boys headed to Austin, TX. There, they found drummer Bryan OFlynn, himself a transplanted Midwesterner hailing from Cincinnati. Over the next two years, the trio crafted their sound and style, all of which culminates September 24th with the release of their self-titled debut. Migrant Kids say the influence for their sound comes from the likes of David Lynch and Constantin Stanislavski’s unique acting methods. Now, an auteur filmmaker and an early 1900s theater technique may not be the kind of reference points that trigger the auditory cortex of your brain. But they could well set off the limbic system, where emotions like passion and wonder dwell, and that’s the kind of stuff that suffuses the band’s songs. Their first single, “Canvas of Me”, sent neurons sparking off towards the sky with its climbing sonic layers; the follow-up single “Lucktear” aims for equal ambitions with even more brazenness. Breathy vocals and humming synths coo over rolling guitars like a scarred, modern take on Floyd’s spaciness. Ojeda and Zakoor tug at your core as they beg for answers to the woeful questions, “Do you even care if I have an opinion? / Can you even bear to know the truth?” When they come round to ask again, the track explodes – literally, there are explosions – before breaking into clamorous chaos. The sudden raising of the stakes feels like a loss of control, but the subtly crafted post-rock keeps it from being jarring, allowing the emotions to rumble forth in a way that feels natural and earned. That quickening of your heart rate? That’s your limbic system telling you that Migrant Kids have your attention. Watch Chance the Rapper cover Kanye West's "All Falls Down"